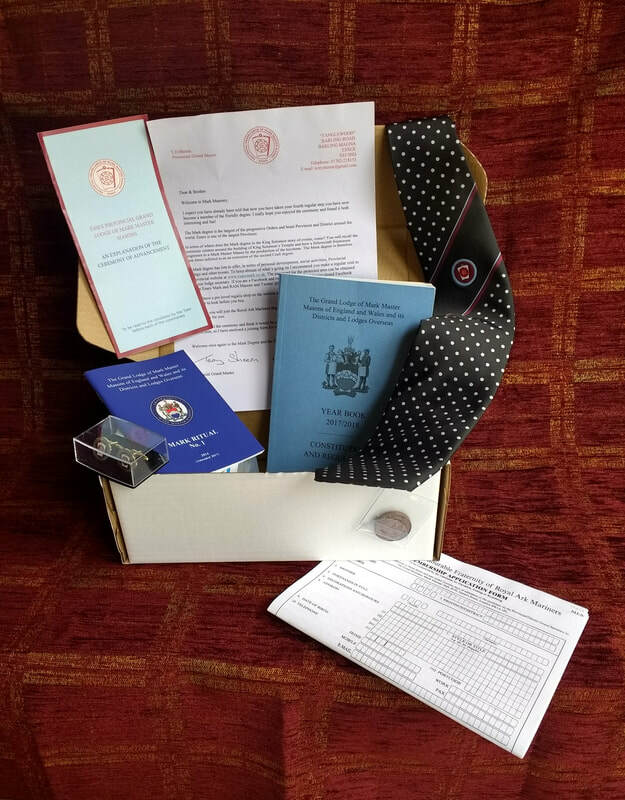 As announced at Provincial Grand Lodge, a new initiative consisting of a box of all essentials for new Mark Advancees has been put together containing all the items essential and necessary for all new Mark Master Masons. On the night of Advancement, our new Brethren are presented with a copy of the Book of Constitutions (which is often then taken back! ), sold a tie, given a ritual book (hopefully!) so as to allow them to make a start on further understanding, told that they can purchase cuff links, given an explanatory leaflet---you get the idea! So, what better than to have all those items (and more) in one package which can be pre purchased by the Lodge or the candidates proposer and second? Any or all of the cost, in part or full, is already covered by elements of the fee for Advancement or can so be, that's a matter for individuals and Lodges to decide. This is, however, we think, an excellent way of making a memorable evening even more so with our new brother being able to go home with all the items that will make him really feel part of your Lodge and your Province. The pack contains a Ritual book, book of Constitutions, an Essex Mark token, Provincial Tie, Provincial cufflinks, a personal letter from the PGM, an explanatory leaflet on the Ceremony and Order in general and details for Essex in particular, an application form for a friend to join the Mark and an application form for the Royal Ark Mariners, all in a handy box. The Advancees Pack provides all that a new member to the Mark Degree needs on his advancement, and is a quick, easy and convenient way that a Lodge can purchase all it needs for the candidate, at a cost of £44.20, plus P&P. Please hit the link to the Regalia shop where a pack can be ordered and delivered straight to you. These are available from the Regalia Store. Please read the order, postage and collection notes carefully.